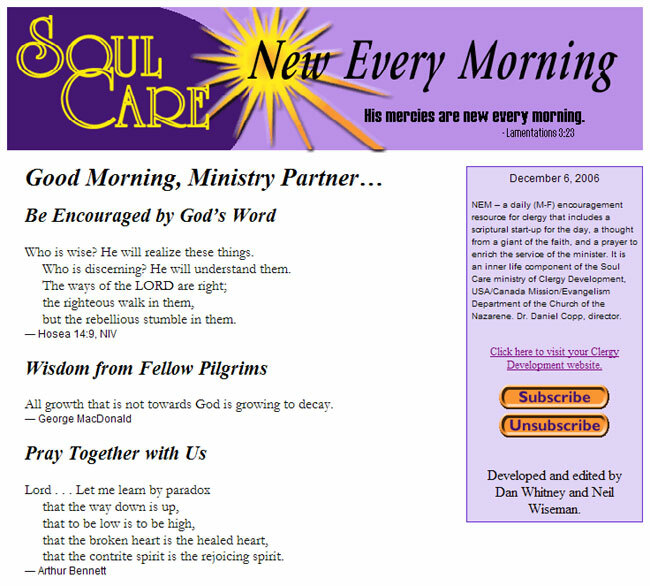 In 2005, Global Clergy Development launched Soul Care, an e-mail resource for Nazarene clergy. New Every Morning, is a Monday-Friday e-mail message containing a biblical promise, an inspiring quote, and a brief prayer. Through Soul Care, Global Clergy Development wants to come alongside our clergy to encourage you, to remind you of how vital your ministry is to so many people, and to affirm how much you are treasured on the ministry team of the Church of the Nazarene. Click here to see an example of Soul Care. "I love the new Soul Care 'New Every Morning' email devotionals. I look forward to receiving them at the beginning of each new day. They are short, inspiring, and perfect for the busy pastor! Brilliant! Thanks!" For questions regarding subscriptions to "New Every Morning" or "Iron Sharpens Iron," please email us at pastor@nazarene.org, or call us at 800-306-7651.